Bonds Payable Long-term debt consists of probable future sacrifices of economic benefits arising from present obligations that are not payable within a year or the operating cycle of the company, whichever is longer. 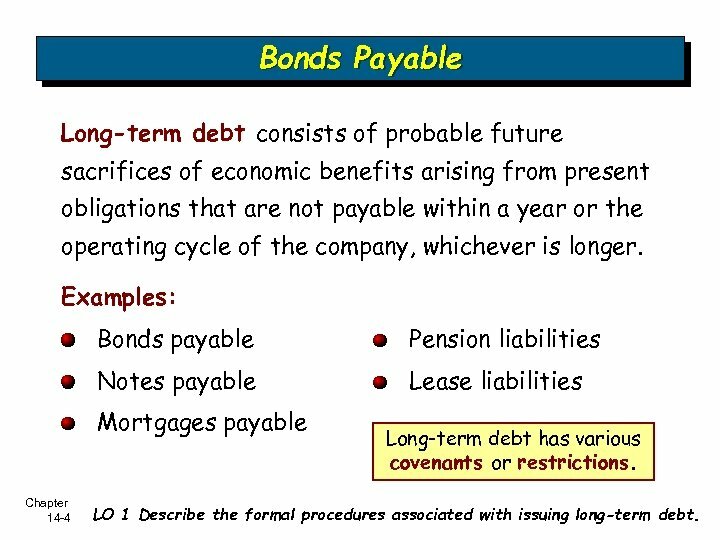 Examples: Bonds payable Pension liabilities Notes payable Lease liabilities Mortgages payable Chapter 14 -4 Long-term debt has various covenants or restrictions. LO 1 Describe the formal procedures associated with issuing long-term debt. 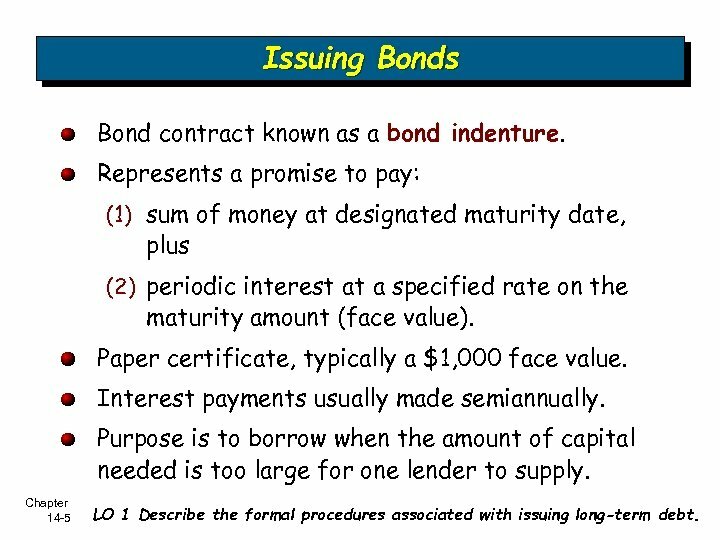 Issuing Bonds Bond contract known as a bond indenture. Represents a promise to pay: (1) sum of money at designated maturity date, plus (2) periodic interest at a specified rate on the maturity amount (face value). 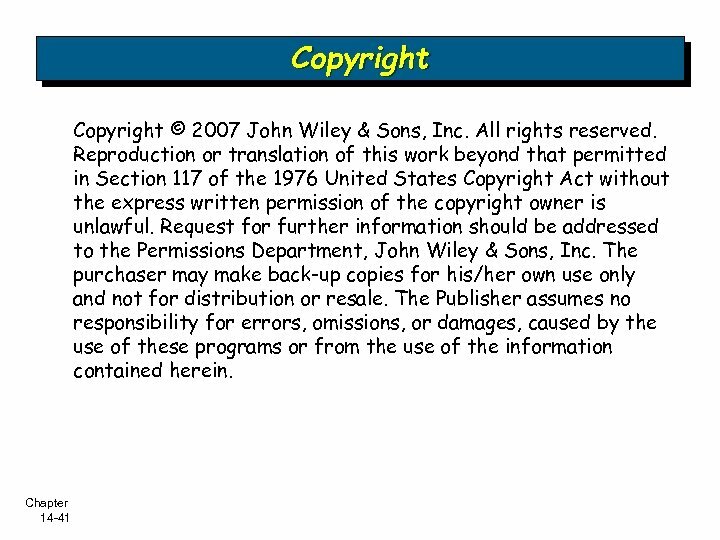 Paper certificate, typically a $1, 000 face value. Interest payments usually made semiannually. Purpose is to borrow when the amount of capital needed is too large for one lender to supply. Chapter 14 -5 LO 1 Describe the formal procedures associated with issuing long-term debt. 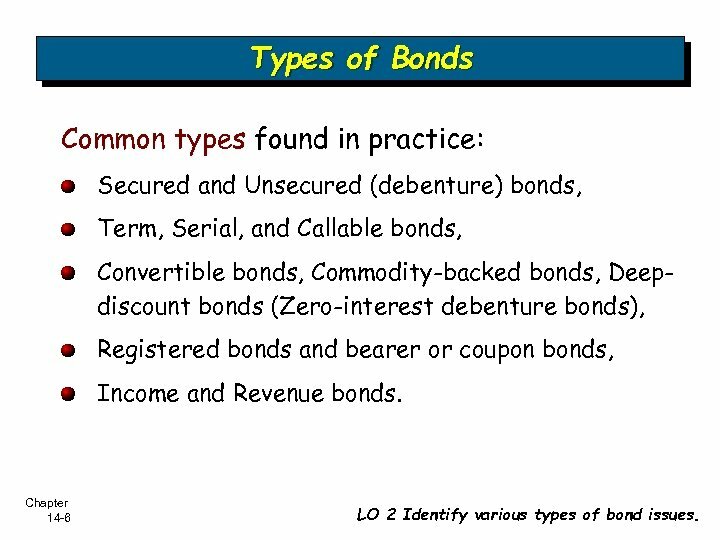 Types of Bonds Common types found in practice: Secured and Unsecured (debenture) bonds, Term, Serial, and Callable bonds, Convertible bonds, Commodity-backed bonds, Deepdiscount bonds (Zero-interest debenture bonds), Registered bonds and bearer or coupon bonds, Income and Revenue bonds. 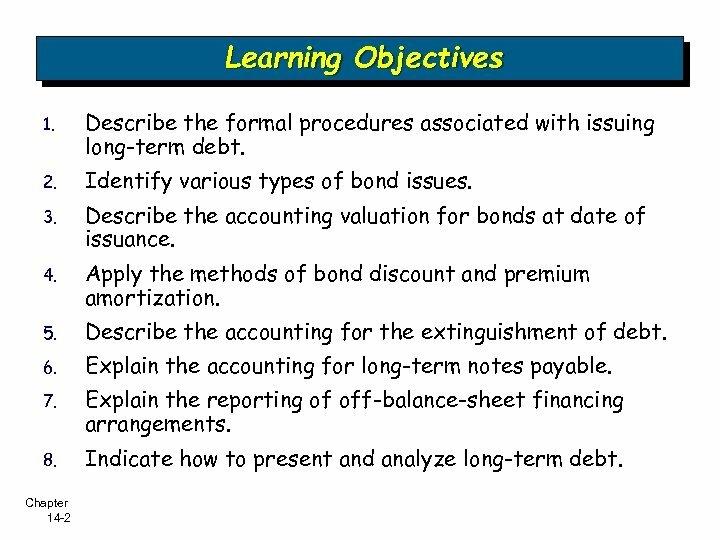 Chapter 14 -6 LO 2 Identify various types of bond issues. Valuation of Bonds – Discount and Premium Between the time the company sets the terms and the time it issues the bonds, the market conditions and the financial position of the issuing corporation may change significantly. Such changes affect the marketability of the bonds and thus their selling price. The investment community values a bond at the present value of its expected future cash flows, which consist of (1) interest and (2) principal. 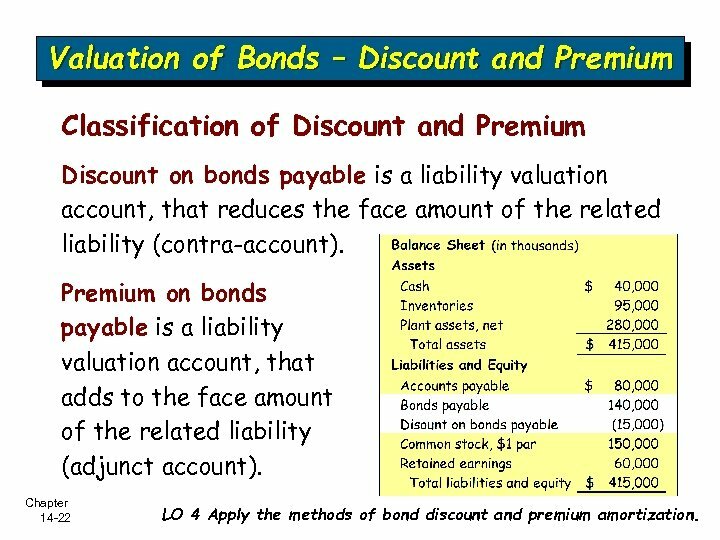 Chapter 14 -7 LO 3 Describe the accounting valuation for bonds at date of issuance. Valuation of Bonds – Discount and Premium Interest Rates Stated, coupon, or nominal rate = The interest rate written in the terms of the bond indenture. Market rate or effective yield = rate that provides an acceptable return on an investment commensurate with the issuer’s risk characteristics. Rate of interest actually earned by the bondholders. 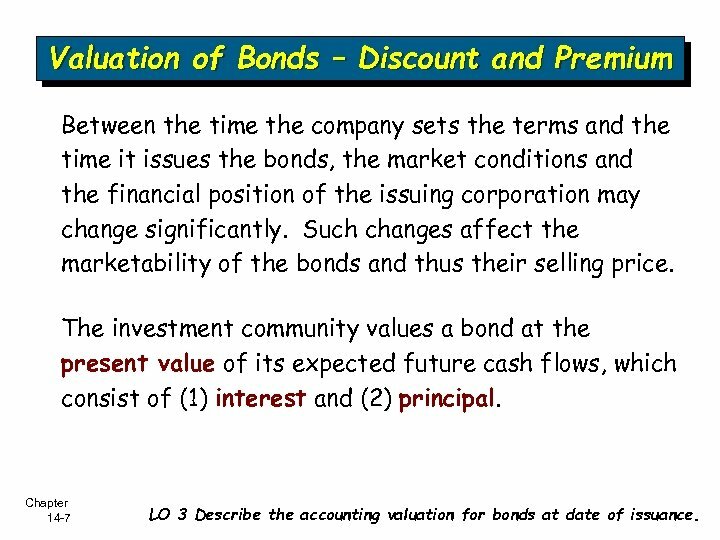 Chapter 14 -8 LO 3 Describe the accounting valuation for bonds at date of issuance. Valuation of Bonds – Discount and Premium How do you calculate the amount of interest that is actually paid to the bondholder each period? (Stated rate x Face Value of the bond) How do you calculate the amount of interest that is actually recorded as interest expense by the issuer of the bonds? 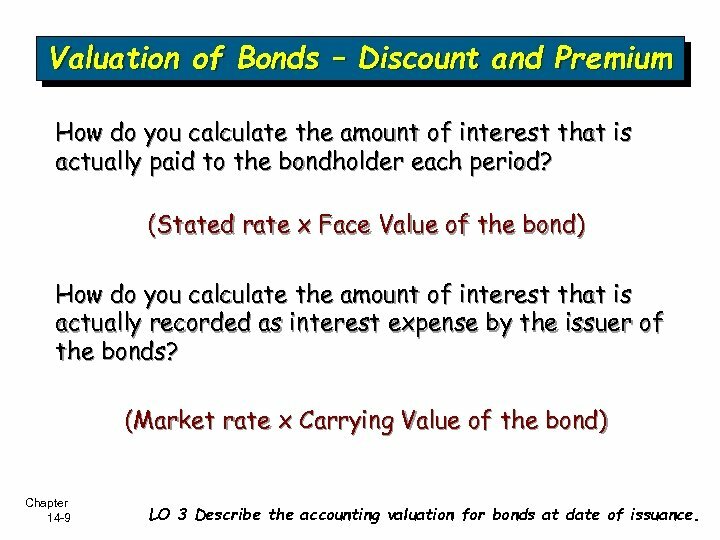 (Market rate x Carrying Value of the bond) Chapter 14 -9 LO 3 Describe the accounting valuation for bonds at date of issuance. 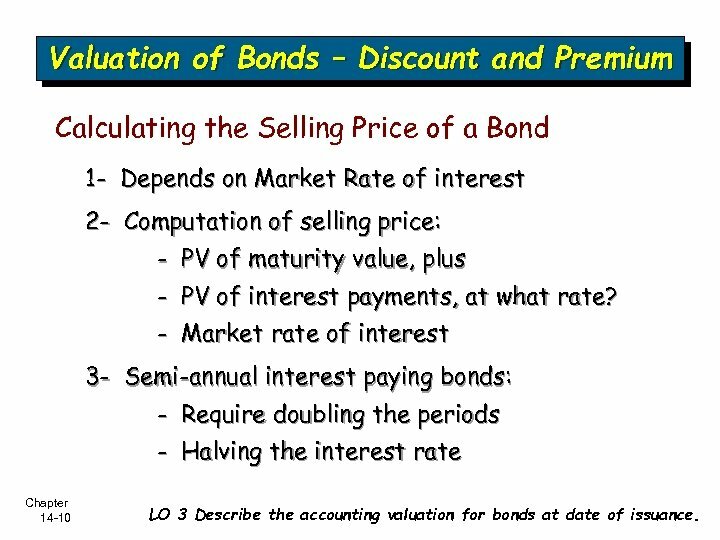 Valuation of Bonds – Discount and Premium Calculating the Selling Price of a Bond 1 - Depends on Market Rate of interest 2 - Computation of selling price: - PV of maturity value, plus - PV of interest payments, at what rate? - Market rate of interest 3 - Semi-annual interest paying bonds: - Require doubling the periods - Halving the interest rate Chapter 14 -10 LO 3 Describe the accounting valuation for bonds at date of issuance. 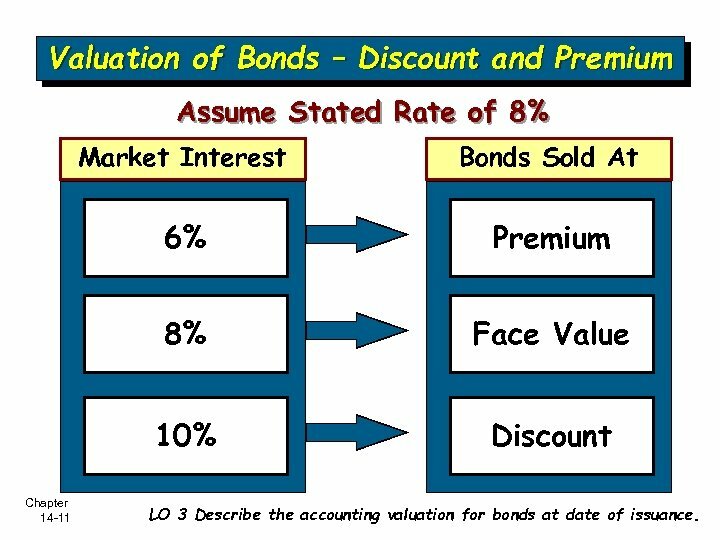 Valuation of Bonds – Discount and Premium Assume Stated Rate of 8% Market Interest 6% Premium 8% Face Value 10% Chapter 14 -11 Bonds Sold At Discount LO 3 Describe the accounting valuation for bonds at date of issuance. Bonds Issued at Par Illustration Three year bonds are issued at face value of $100, 000 on Jan. 1, 2007, with a stated interest rate of 8%. Interest paid annually on Dec. 31. Calculate the issue price of the bonds, market interest rate of 8%. 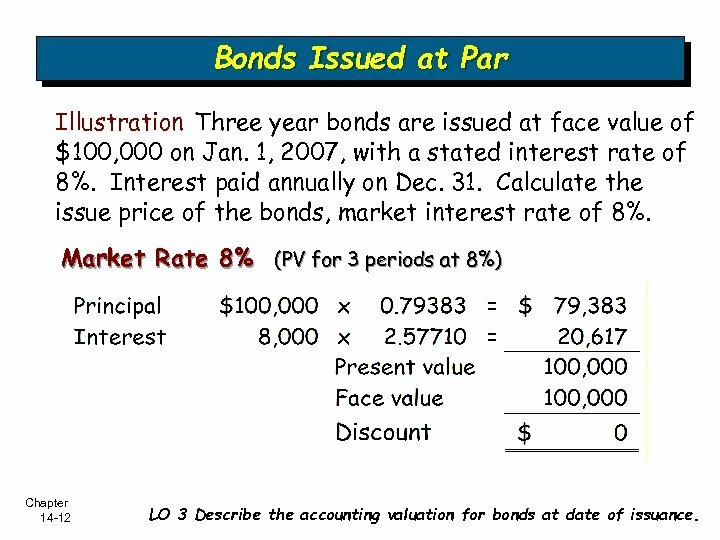 Market Rate 8% (PV for 3 periods at 8%) Chapter 14 -12 LO 3 Describe the accounting valuation for bonds at date of issuance. Bonds Issued at Par Illustration Three year bonds are issued at face value of $100, 000 on Jan. 1, 2007, a stated interest rate of 8%, and market rate of 8%. 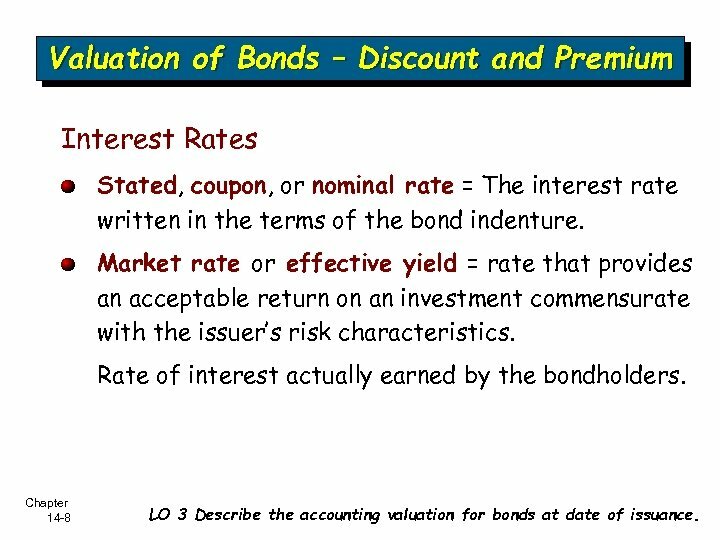 Chapter 14 -13 LO 3 Describe the accounting valuation for bonds at date of issuance. 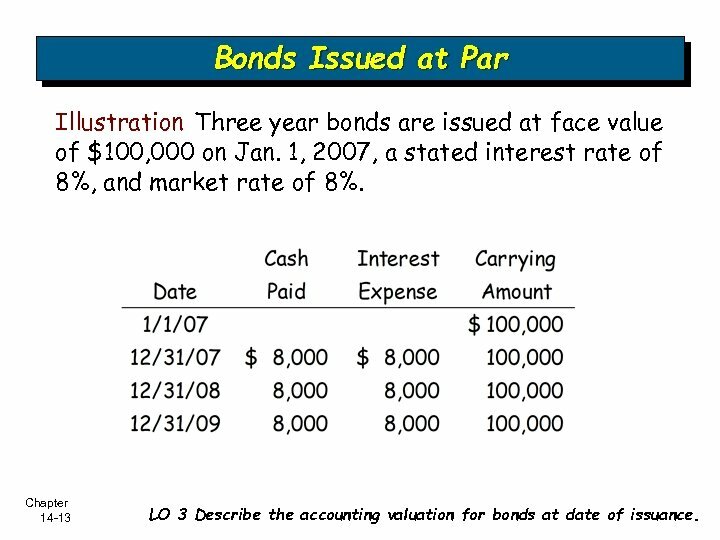 Bonds Issued at Par Illustration Stated rate = 8%. Market rate = 8%. 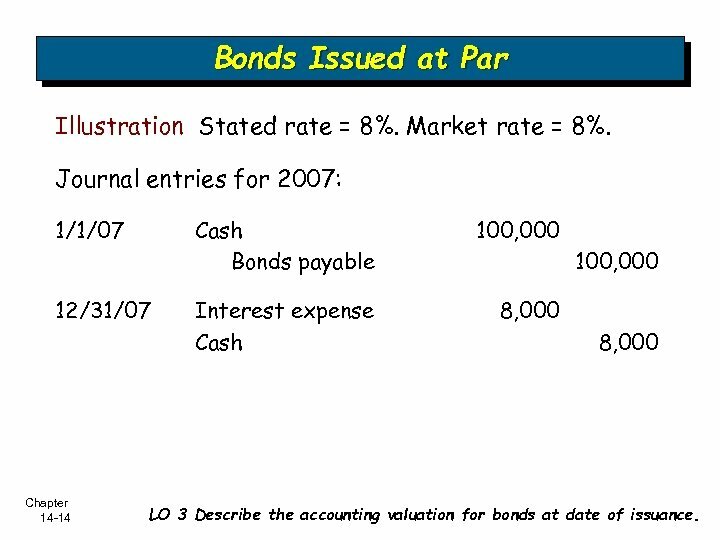 Journal entries for 2007: 1/1/07 Cash Bonds payable 12/31/07 Chapter 14 -14 100, 000 Interest expense Cash 8, 000 100, 000 8, 000 LO 3 Describe the accounting valuation for bonds at date of issuance. 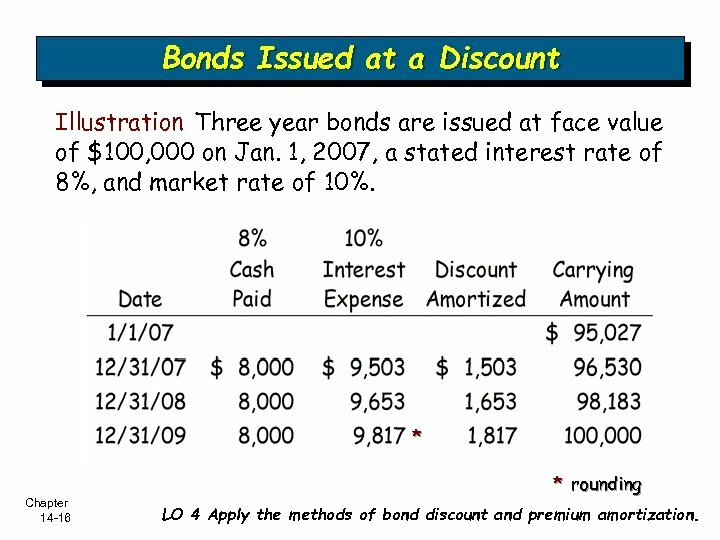 Bonds Issued at a Discount Illustration Three year bonds are issued at face value of $100, 000 on Jan. 1, 2007, and a stated interest rate of 8%. Calculate the issue price of the bonds assuming a market interest rate of 10%. Market Rate 10% (PV for 3 periods at 10%) Chapter 14 -15 LO 4 Apply the methods of bond discount and premium amortization. Bonds Issued at a Discount Illustration Three year bonds are issued at face value of $100, 000 on Jan. 1, 2007, a stated interest rate of 8%, and market rate of 10%. * * rounding Chapter 14 -16 LO 4 Apply the methods of bond discount and premium amortization. 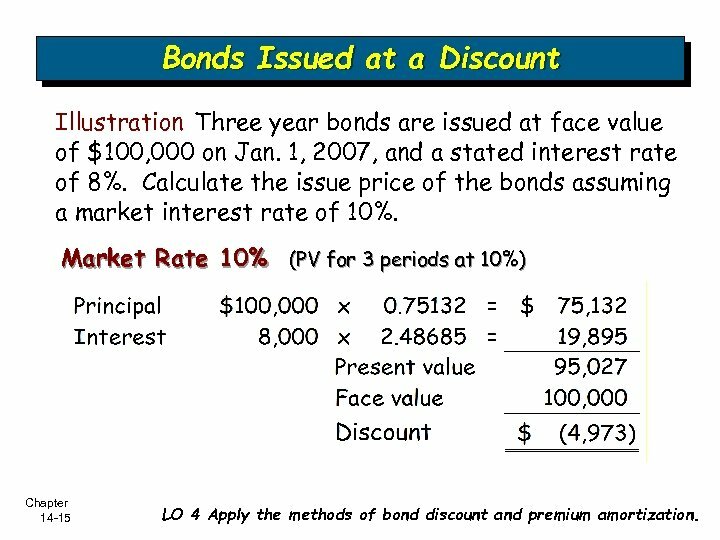 Bonds Issued at a Discount Illustration Stated rate = 8%. Market rate = 10%. 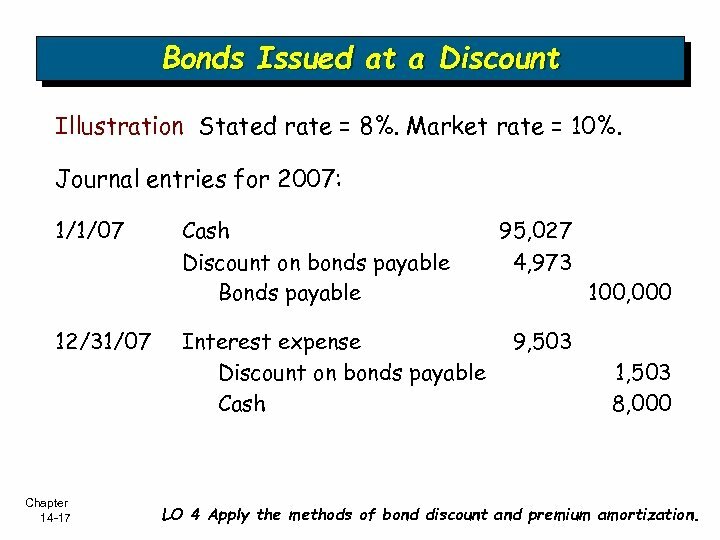 Journal entries for 2007: 1/1/07 12/31/07 Chapter 14 -17 Cash Discount on bonds payable Bonds payable Interest expense Discount on bonds payable Cash 95, 027 4, 973 100, 000 9, 503 1, 503 8, 000 LO 4 Apply the methods of bond discount and premium amortization. Bonds Issued at a Premium Illustration Three year bonds are issued at face value of $100, 000 on Jan. 1, 2007, and a stated interest rate of 8%. Calculate the issue price of the bonds assuming a market interest rate of 6%. Market Rate 6% (PV for 3 periods at 6%) Chapter 14 -18 LO 4 Apply the methods of bond discount and premium amortization. Bonds Issued at a Premium Illustration Three year bonds are issued at face value of $100, 000 on Jan. 1, 2007, a stated interest rate of 8%, and market rate of 6%. Chapter 14 -19 LO 4 Apply the methods of bond discount and premium amortization. Bonds Issued at a Premium Illustration Stated rate = 8%. Market rate = 6%. 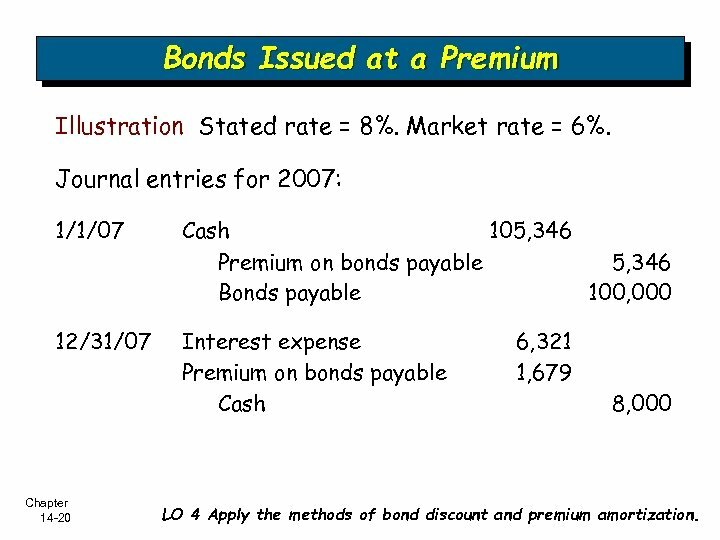 Journal entries for 2007: 1/1/07 Cash 105, 346 Premium on bonds payable 5, 346 Bonds payable 100, 000 12/31/07 Interest expense Premium on bonds payable Cash Chapter 14 -20 6, 321 1, 679 8, 000 LO 4 Apply the methods of bond discount and premium amortization. 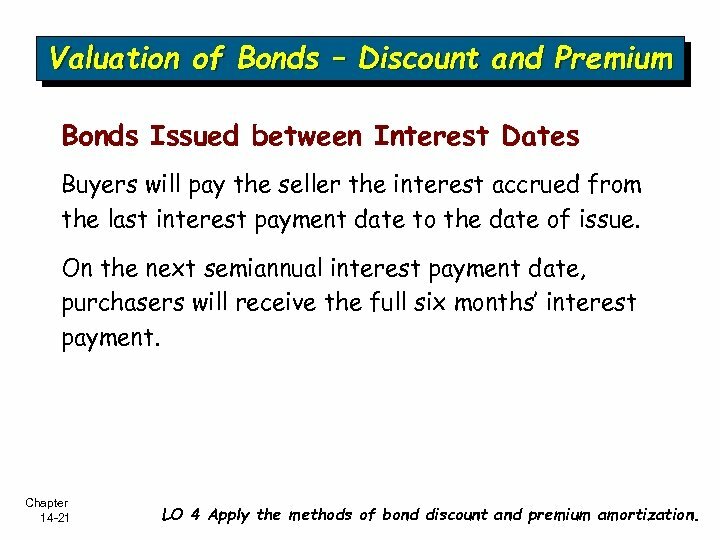 Valuation of Bonds – Discount and Premium Bonds Issued between Interest Dates Buyers will pay the seller the interest accrued from the last interest payment date to the date of issue. On the next semiannual interest payment date, purchasers will receive the full six months’ interest payment. Chapter 14 -21 LO 4 Apply the methods of bond discount and premium amortization. Valuation of Bonds – Discount and Premium Classification of Discount and Premium Discount on bonds payable is a liability valuation account, that reduces the face amount of the related liability (contra-account). Premium on bonds payable is a liability valuation account, that adds to the face amount of the related liability (adjunct account). Chapter 14 -22 LO 4 Apply the methods of bond discount and premium amortization. 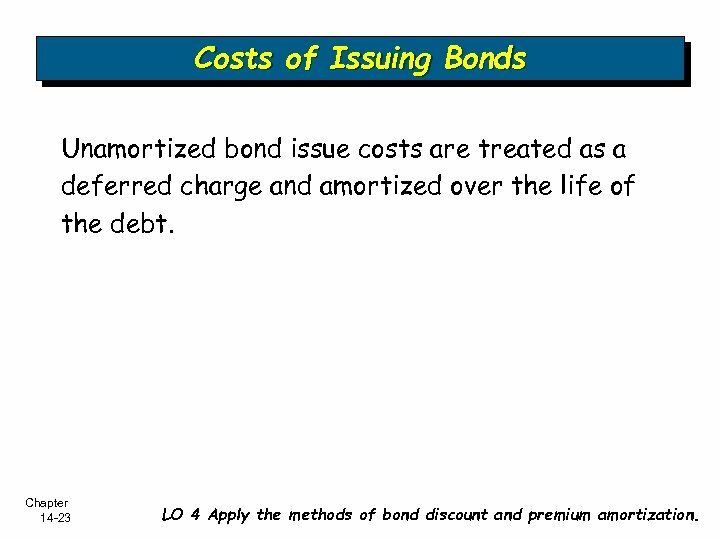 Costs of Issuing Bonds Unamortized bond issue costs are treated as a deferred charge and amortized over the life of the debt. Chapter 14 -23 LO 4 Apply the methods of bond discount and premium amortization. 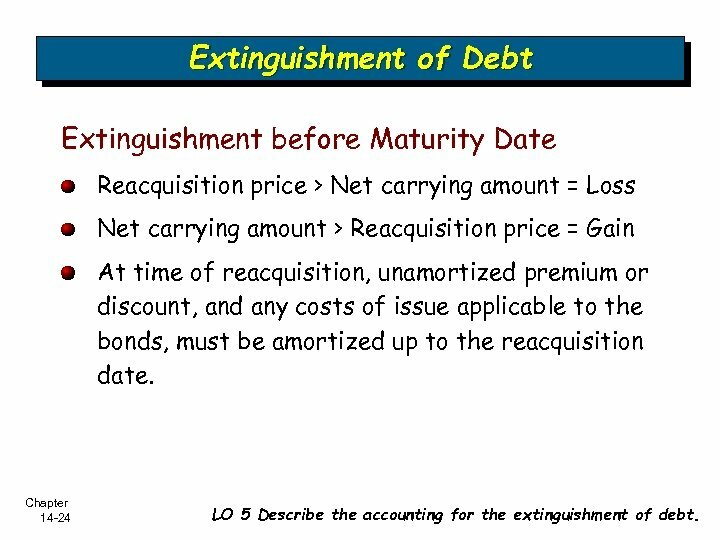 Extinguishment of Debt Extinguishment before Maturity Date Reacquisition price > Net carrying amount = Loss Net carrying amount > Reacquisition price = Gain At time of reacquisition, unamortized premium or discount, and any costs of issue applicable to the bonds, must be amortized up to the reacquisition date. 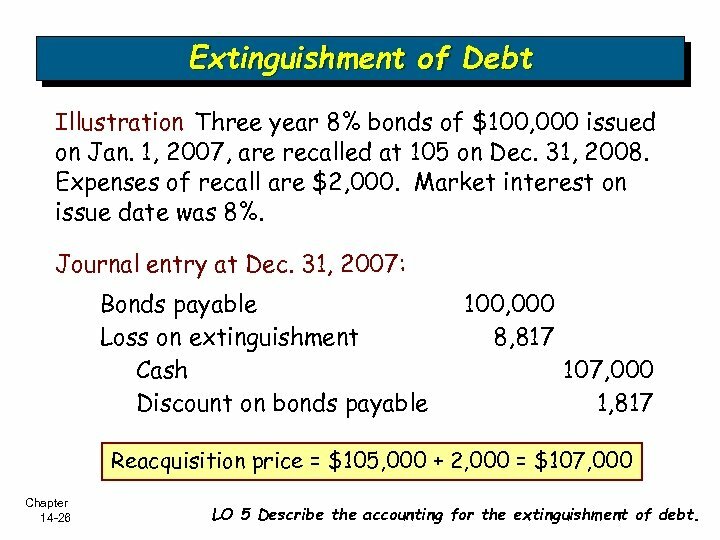 Chapter 14 -24 LO 5 Describe the accounting for the extinguishment of debt. Extinguishment of Debt Illustration Three year 8% bonds of $100, 000 issued on Jan. 1, 2007, are recalled at 105 on Dec. 31, 2008. Expenses of recall are $2, 000. Market interest on issue date was 8%. 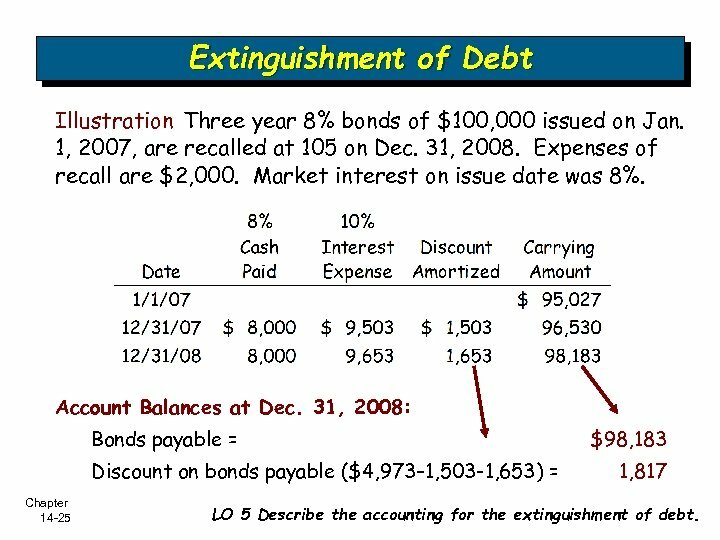 Account Balances at Dec. 31, 2008: Bonds payable = Discount on bonds payable ($4, 973– 1, 503 -1, 653) = Chapter 14 -25 $98, 183 1, 817 LO 5 Describe the accounting for the extinguishment of debt. Extinguishment of Debt Illustration Three year 8% bonds of $100, 000 issued on Jan. 1, 2007, are recalled at 105 on Dec. 31, 2008. Expenses of recall are $2, 000. Market interest on issue date was 8%. Journal entry at Dec. 31, 2007: Bonds payable Loss on extinguishment Cash Discount on bonds payable 100, 000 8, 817 107, 000 1, 817 Reacquisition price = $105, 000 + 2, 000 = $107, 000 Chapter 14 -26 LO 5 Describe the accounting for the extinguishment of debt. 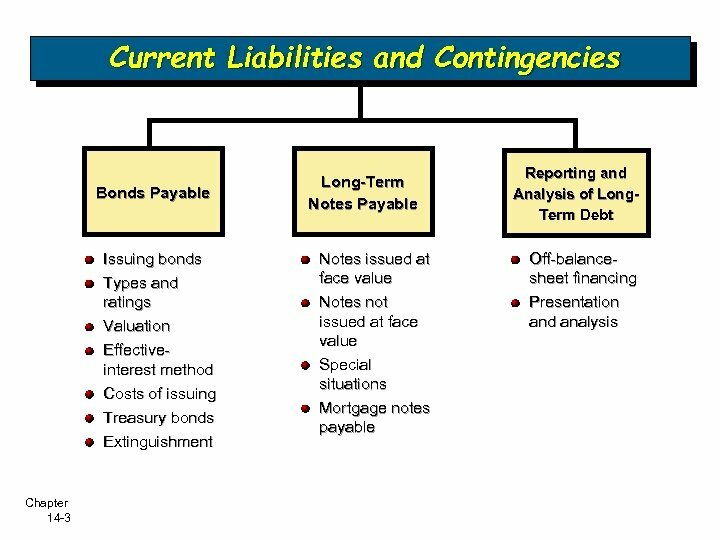 Long-Term Notes Payable Accounting is Similar to Bonds A note is valued at the present value of its future interest and principal cash flows. Company amortizes any discount or premium over the life of the note. 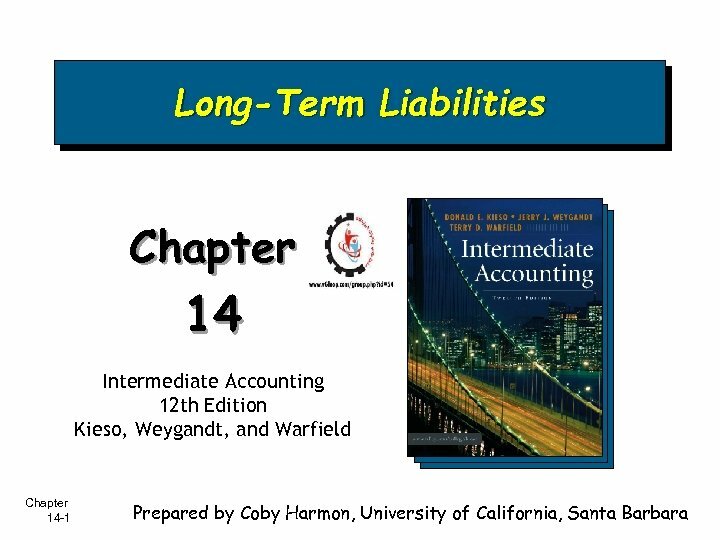 Chapter 14 -27 LO 6 Explain the accounting for long-term notes payable. 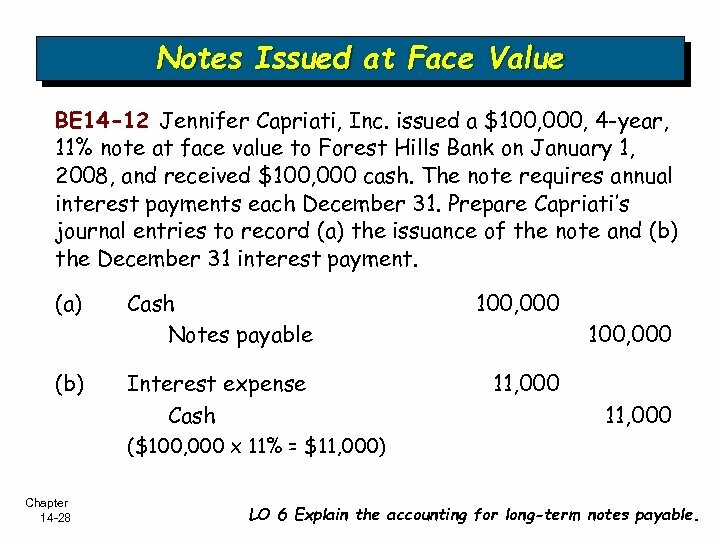 Notes Issued at Face Value BE 14 -12 Jennifer Capriati, Inc. issued a $100, 000, 4 -year, 11% note at face value to Forest Hills Bank on January 1, 2008, and received $100, 000 cash. The note requires annual interest payments each December 31. 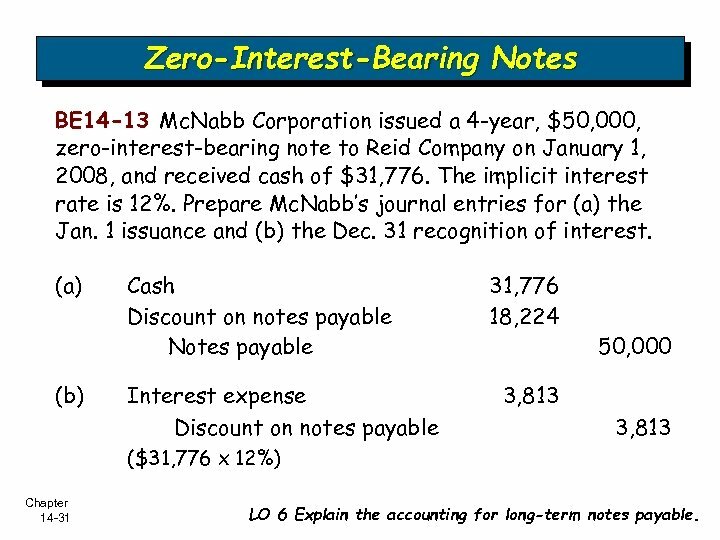 Prepare Capriati’s journal entries to record (a) the issuance of the note and (b) the December 31 interest payment. 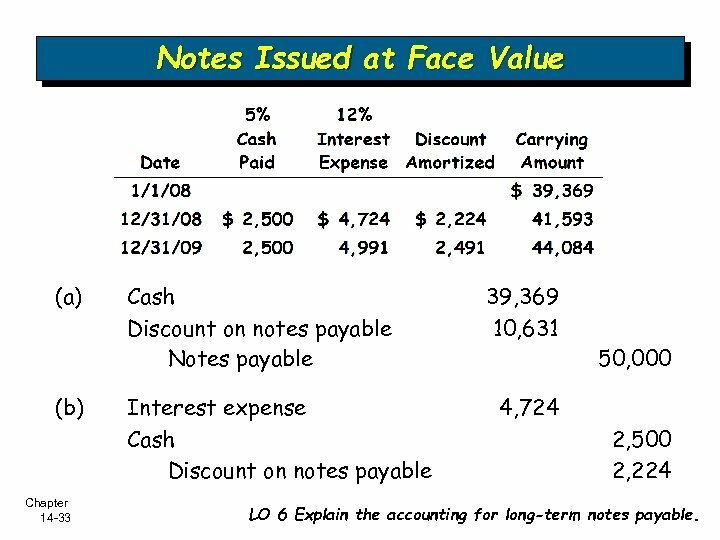 (a) (b) Cash Notes payable Interest expense Cash 100, 000 11, 000 ($100, 000 x 11% = $11, 000) Chapter 14 -28 LO 6 Explain the accounting for long-term notes payable. 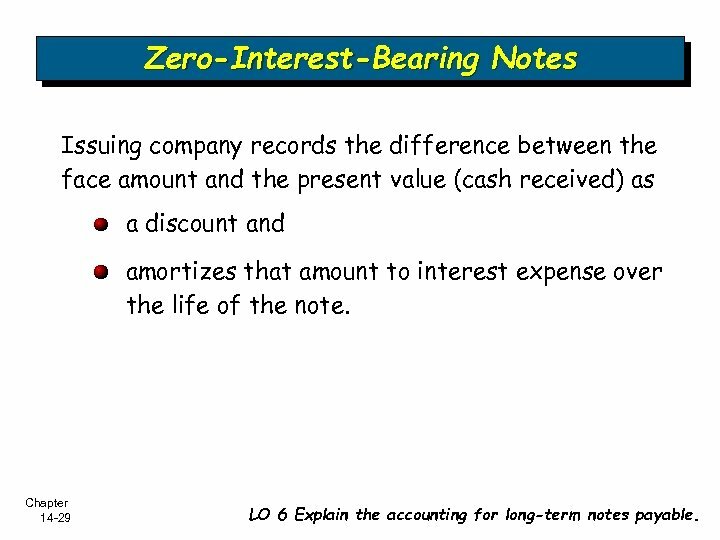 Zero-Interest-Bearing Notes Issuing company records the difference between the face amount and the present value (cash received) as a discount and amortizes that amount to interest expense over the life of the note. Chapter 14 -29 LO 6 Explain the accounting for long-term notes payable. Zero-Interest-Bearing Notes BE 14 -13 Mc. Nabb Corporation issued a 4 -year, $50, 000, zero-interest-bearing note to Reid Company on January 1, 2008, and received cash of $31, 776. The implicit interest rate is 12%. Prepare Mc. Nabb’s journal entries for (a) the Jan. 1 issuance and (b) the Dec. 31 recognition of interest. 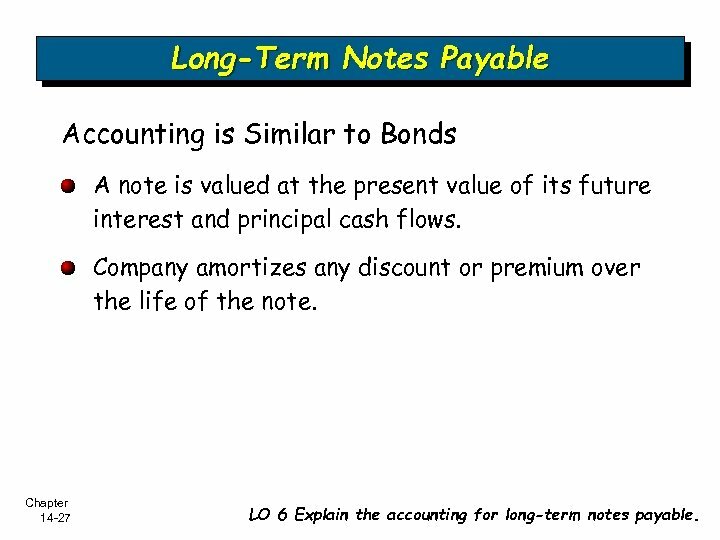 Chapter 14 -30 LO 6 Explain the accounting for long-term notes payable. Zero-Interest-Bearing Notes BE 14 -13 Mc. 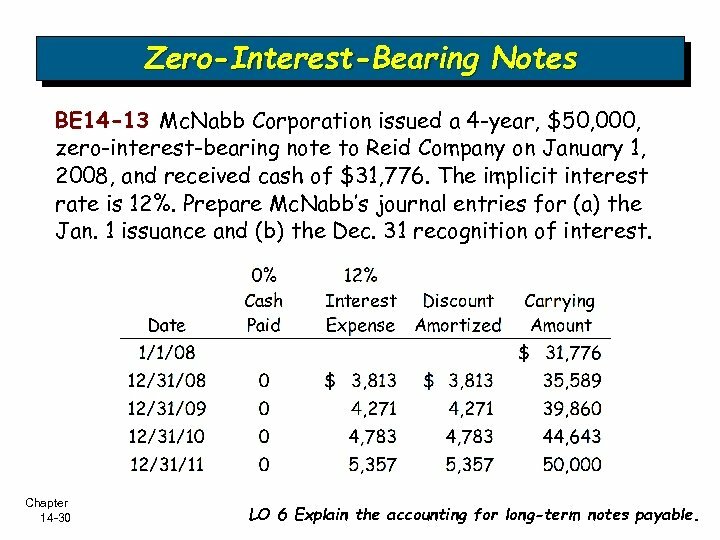 Nabb Corporation issued a 4 -year, $50, 000, zero-interest-bearing note to Reid Company on January 1, 2008, and received cash of $31, 776. The implicit interest rate is 12%. Prepare Mc. Nabb’s journal entries for (a) the Jan. 1 issuance and (b) the Dec. 31 recognition of interest. (a) (b) Cash Discount on notes payable Notes payable Interest expense Discount on notes payable 31, 776 18, 224 50, 000 3, 813 ($31, 776 x 12%) Chapter 14 -31 LO 6 Explain the accounting for long-term notes payable. 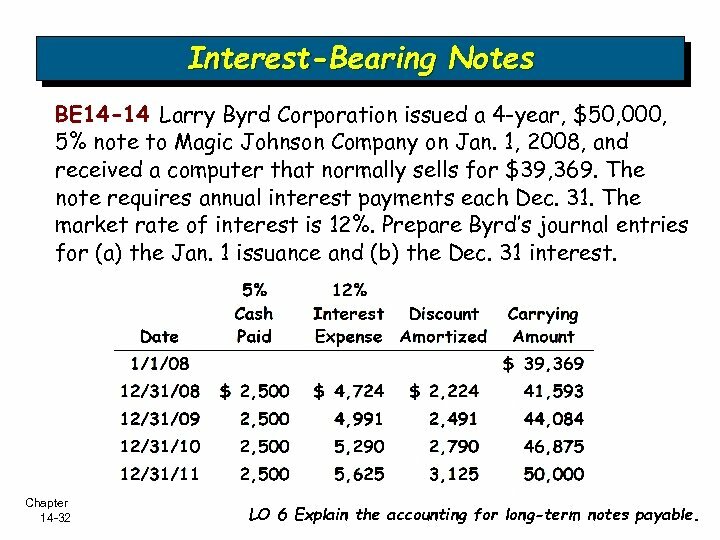 Interest-Bearing Notes BE 14 -14 Larry Byrd Corporation issued a 4 -year, $50, 000, 5% note to Magic Johnson Company on Jan. 1, 2008, and received a computer that normally sells for $39, 369. The note requires annual interest payments each Dec. 31. The market rate of interest is 12%. Prepare Byrd’s journal entries for (a) the Jan. 1 issuance and (b) the Dec. 31 interest. Chapter 14 -32 LO 6 Explain the accounting for long-term notes payable. Notes Issued at Face Value (a) (b) Chapter 14 -33 Cash Discount on notes payable Notes payable Interest expense Cash Discount on notes payable 39, 369 10, 631 50, 000 4, 724 2, 500 2, 224 LO 6 Explain the accounting for long-term notes payable. 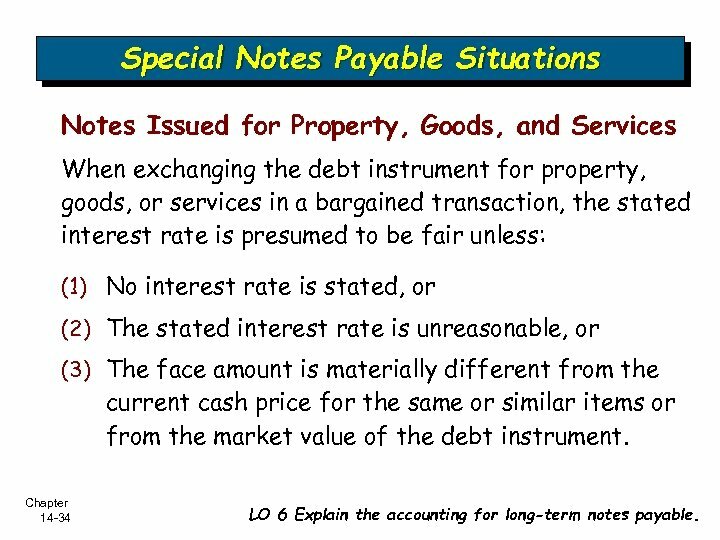 Special Notes Payable Situations Notes Issued for Property, Goods, and Services When exchanging the debt instrument for property, goods, or services in a bargained transaction, the stated interest rate is presumed to be fair unless: (1) No interest rate is stated, or (2) The stated interest rate is unreasonable, or (3) The face amount is materially different from the current cash price for the same or similar items or from the market value of the debt instrument. Chapter 14 -34 LO 6 Explain the accounting for long-term notes payable. 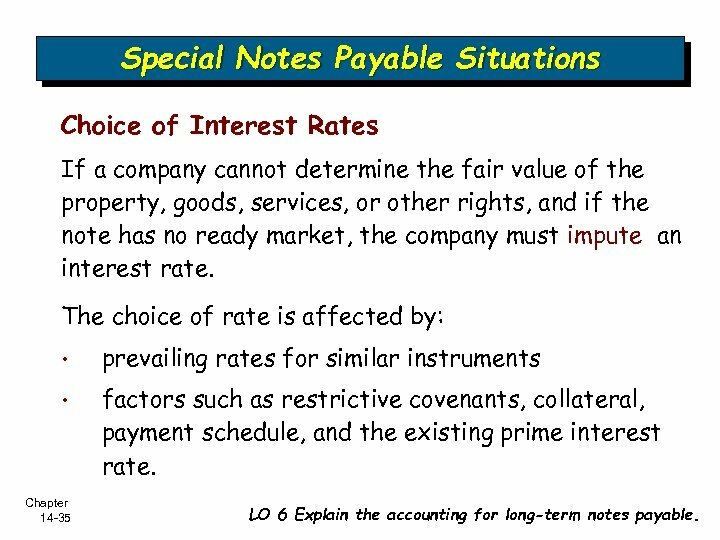 Special Notes Payable Situations Choice of Interest Rates If a company cannot determine the fair value of the property, goods, services, or other rights, and if the note has no ready market, the company must impute an interest rate. The choice of rate is affected by: • prevailing rates for similar instruments • factors such as restrictive covenants, collateral, payment schedule, and the existing prime interest rate. Chapter 14 -35 LO 6 Explain the accounting for long-term notes payable. 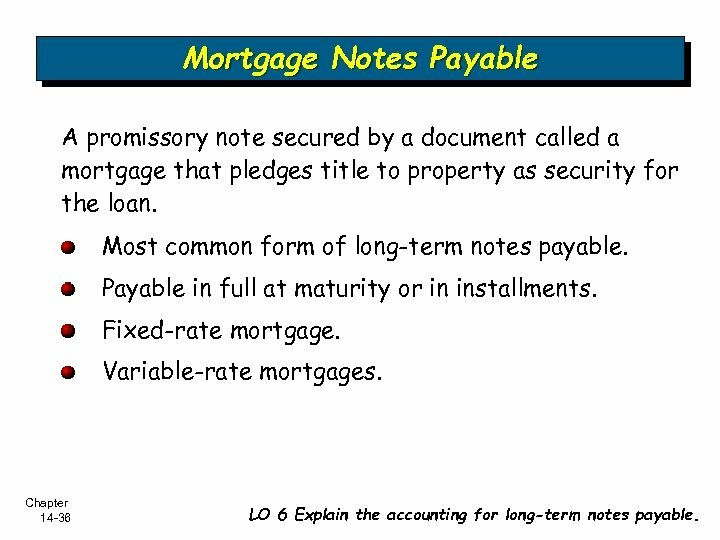 Mortgage Notes Payable A promissory note secured by a document called a mortgage that pledges title to property as security for the loan. Most common form of long-term notes payable. Payable in full at maturity or in installments. Fixed-rate mortgage. Variable-rate mortgages. Chapter 14 -36 LO 6 Explain the accounting for long-term notes payable. Off-Balance-Sheet Financing An attempt to borrow monies in such a way to prevent recording the obligations. Different Forms: • Non-Consolidated Subsidiary • Special Purpose Entity (SPE) • Operating Leases Chapter 14 -37 LO 7 Explain the reporting of off-balance-sheet financing arrangements. 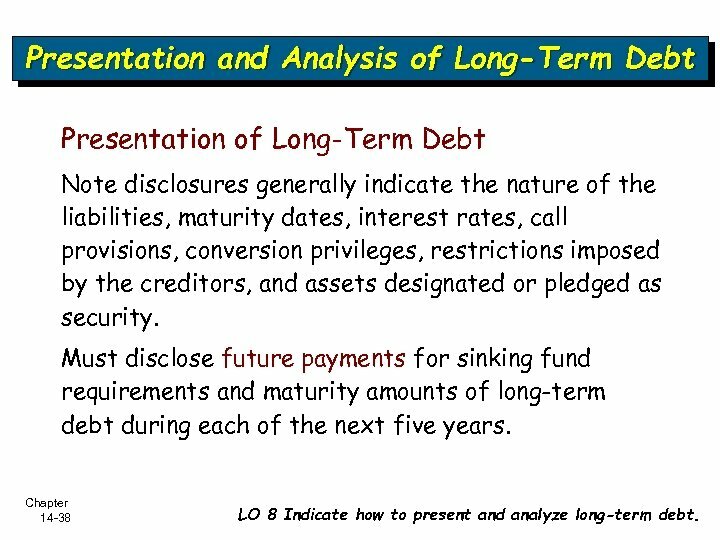 Presentation and Analysis of Long-Term Debt Presentation of Long-Term Debt Note disclosures generally indicate the nature of the liabilities, maturity dates, interest rates, call provisions, conversion privileges, restrictions imposed by the creditors, and assets designated or pledged as security. Must disclose future payments for sinking fund requirements and maturity amounts of long-term debt during each of the next five years. 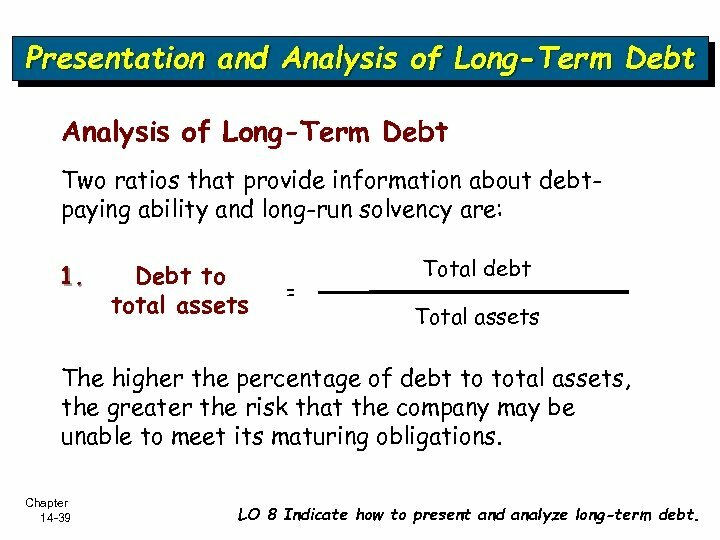 Chapter 14 -38 LO 8 Indicate how to present and analyze long-term debt. Presentation and Analysis of Long-Term Debt Two ratios that provide information about debtpaying ability and long-run solvency are: 1. Debt to total assets = Total debt Total assets The higher the percentage of debt to total assets, the greater the risk that the company may be unable to meet its maturing obligations. 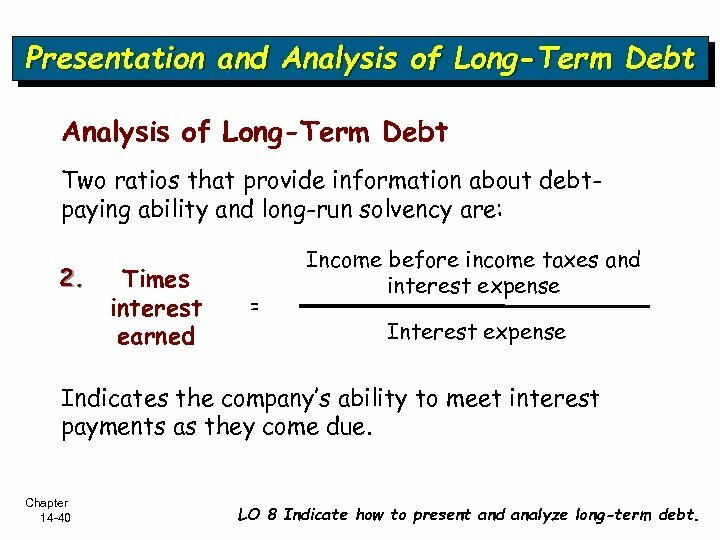 Chapter 14 -39 LO 8 Indicate how to present and analyze long-term debt. Presentation and Analysis of Long-Term Debt Two ratios that provide information about debtpaying ability and long-run solvency are: 2. Times interest earned = Income before income taxes and interest expense Indicates the company’s ability to meet interest payments as they come due. Chapter 14 -40 LO 8 Indicate how to present and analyze long-term debt.